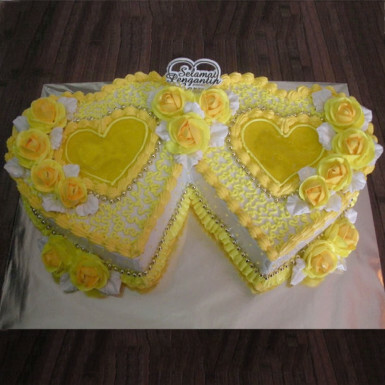 This double heart shape cake in pineapple flavor epitomizes that two hearts are same and share a common bond called “love”. Nurture your bond by including sweetness of cake in your relationship. The cake is the perfect gift for Valentine day, anniversary, kiss day, propose day, rose day or any other special occasion. This delicious cake is made of rich ingredients and its taste is irresistible. You can never go wrong with this double heart shape cake. So, go ahead and place your order now! really happy to order from winni...they assisted very nicely on phone and all the customization was done properly...good quality service...keep it up! !